With fire season now upon us, it’s a good time to talk about how science can inform forest management. Scientific research is used to help develop forestry practices that keep Oregon’s forests healthy and thriving, but we should be cautious about using the findings of one university-led study to make broad policy conclusions about how to manage our forests. That’s the case with a study by researchers Harold Zald and Chrisopher Dunn of Humboldt State University and Oregon State University, respectively. Their study examined fire severity on the 2013 Douglas Complex fire, which burned an area of southwestern Oregon where public and private forestland are arranged in a checkerboard pattern. The 50,000-acre fire burned across Bureau of Land Management forests, which are mostly older, and adjacent private lands with plantations of mainly younger trees. The study, published in the scientific journal Ecological Applications, found that weather was the primary factor in determining fire severity, but ownership, forest age and topography also played a role. 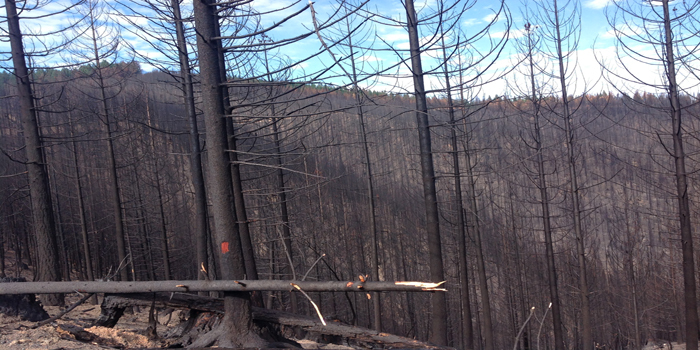 It concluded fire severity was greater in private plantations than in older public forests. “Fire severity” is defined as the amount of damage to the forest trees. It is determined by the intensity or amount of heat that a fire produces and the susceptibility of vegetation to damage. By that definition, it’s no surprise that plantations burn with high severity, given their composition of smaller trees and lots of low branches loaded with needles. That seems like a stretch. The only conclusion I draw is that forest management practices may contribute to increased wildfire severity and tree mortality in the plantations they studied. Making a broad statement that forest management contributes to wildfire risk and therefore greater chances of a severe fire happening is simply unwarranted. This was one wildfire at one point in time. One of the researchers told a reporter, “To me, it means they [private landowners] share in the responsibility in this checkerboard landscape to the overall picture of fire risk.” This statement overlooks the fact that Oregon forest landowners already pay half the cost of fighting fires across the state. The remainder comes from Oregon’s General Fund. In most other states, taxpayers fund all firefighting. Private forest landowners hardly needed a study to point out that younger trees are easily killed by fire. They already do everything they can to keep fire out of young plantations. This includes paying for a statewide network to fight fires, attacking immediately when a fire breaks out, constantly monitoring by air and by land to spot fires when they occur, and maintaining a road network so that firefighters have access. Planting trees is a huge investment, and no landowner wants to see them go up in smoke. A more important question about fire is its spread, or where it begins and where it goes. How a fire spreads is mostly driven by fine surface fuels and weather. All forests have some fuel, so fire can spread differently depending on the nature of the fuel, the topography and the weather. In the case of the Douglas Complex, most of the fires began on public land and then spread to private land. On July 26, 2013, dry lightning slammed Douglas County. Over 200 lighting strikes were reported, igniting 54 fires in a few hours’ time. While the majority of the fires were caught at the initial attack phase, some grew large very quickly to become the Douglas Complex. According to the Douglas Forest Protective Association, three of the lightning-started fires that could not be extinguished immediately were on BLM land. Other fires started on private land. In my conversations with firefighters, they told me that they had success stopping the fire in the private plantations when conditions were favorable, especially where logging slash and other fuels were reduced following a timber harvest and prior to planting tree seedlings. We need science to inform forest management. We don’t need studies that point out the obvious and then draw false or misleading policy conclusions. The Zald-Dunn study provides scientific information on the likely severity of fire in forest plantations. It points out the need for improved site preparation by removing or burning slash to reduce fire intensity and severity in plantations. However, a conclusion that forest plantations increase the risk of fire on the landscape is not warranted. What does OFRI stand for? In the late 1980s, forest landowners and the Oregon Legislature began to realize the forest sector needed a public agency to advocate for the importance of Oregon’s forests, forest management and forest products. So in 1991 the Legislature created OFRI. The Institute operates under a model similar to Oregon’s 23 agricultural commodity commissions. Each of those is funded by a privilege tax, paid by growers, to support their educational and marketing activities, and each is governed by a volunteer board whose members are appointed by the director of the Oregon Department of Agriculture. Because OFRI deals with forestry, the Oregon State Forester appoints our board’s voting members, who represent landowners managing small, medium and large tracts of forestland in Oregon. The 13-member board also includes a member who represents forest-industry employees, as well as two non-voting members: the dean of the Oregon State University College of Forestry and a public representative appointed by the president of the Oregon Senate and the speaker of the Oregon House of Representatives. State laws govern all of OFRI’s activities. The board meets at least quarterly. The meetings are open to the public, and there is opportunity for public comment. Revenue to support OFRI’s educational programs comes from a portion of a timber harvest tax. The Institute does not receive state general fund money. And even through the majority of OFRI’s revenue comes from private landowners, OFRI advocates for all of Oregon’s forests – public and private. OFRI’s mission is to advance public understanding of Oregon’s forests, forest management and forest products. Our audiences include the general public, K-12 students and teachers, forest landowners and the users of wood products in the architecture, engineering and construction community. We work closely with experts in the scientific, academic and educational communities at Oregon State University, the Oregon Department of Forestry and non-governmental organizations, to make sure the information we present is factual, current and credible. 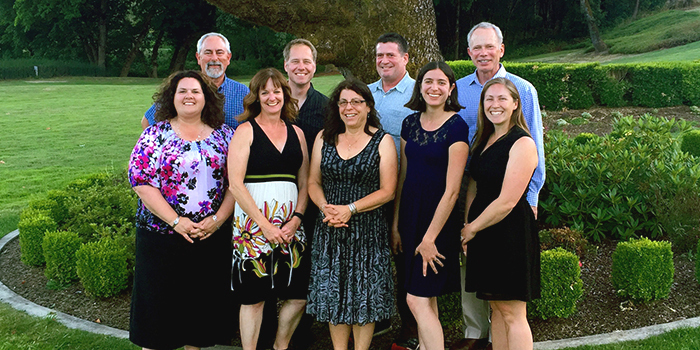 Our work is directed by nine employees (shown in photo above) – six in Portland and three in our office at The Oregon Garden in Silverton, where we manage a 15-acre forest used for educational purposes. We rely on contractors for specialized services such as advertising, websites, publications, curriculum development, teacher professional development, etc. OFRI’s budget is about $4 million, with roughly one-quarter of that spent on television and digital advertising. History has shown that educational advertising is the best way to reach Oregon’s growing population, especially newcomers who have little or no connection with natural-resource use. It’s a privilege to tell the story of all of Oregon’s forests, which include public and private forestland, as well as parks, reserves and wilderness areas. It’s also a challenge – one we undertake with energy, humility and grace. May is Building Safety Month. And why not? We have a National Corn Dog Day each year, so surely we ought to have a Building Safety Month. According to the International Code Council (ICC), an association dedicated to developing the building codes and safety standards used in design and construction across the U.S. and internationally, Building Safety Month is a public awareness campaign, celebrated by jurisdictions worldwide for the past 38 years, to help folks understand what it takes to create safe, sustainable structures. This year’s celebration is particularly apt because it comes barely two weeks after the ICC approved – by substantial margins – 14 proposed amendments to the International Building Code related to tall wood buildings. I attended ICC hearings held in Columbus, Ohio, to consider the code amendments, and testified in favor of them on behalf of Oregon’s Wood Products Working Group. Convened by the office of Gov. Kate Brown, the group works to expand and support the state’s advanced wood products industry. Combined, the proposed code amendments would allow three new types of mass timber construction, including tall wood buildings of up to 18 stories. Here in Oregon, the state’s Code Review Committee has since voted to adopt the code changes approved by the ICC in Columbus into Oregon’s state building code, word for word. Assuming that recommendation makes it through the Building Codes Structures Board, it will be easier to obtain a building permit to construct a tall wood building in Oregon starting in October 2019. These actions taken by the pre-eminent construction-code bodies are ample evidence that tall wood buildings are safe. Skeptics, though, might feel the need to see for themselves the evidence considered by the code bodies, nearly all of which addresses fire safety. To help spread the word about the safety of tall wood buildings, the Mass Timber Code Coalition, consisting of building officials, architects, engineers and a wide range of organizations including OFRI, is providing complete information on the proposed changes to the International Building Code on buildtallbuildsafe.com, including fire test results. But mass timber building safety doesn’t stop there. Last year the U.S. Department of Agriculture Forest Products Lab, in conjunction with WoodWorks and the Softwood Lumber Board, led a series of live blast tests to demonstrate the capability of cross-laminated timber (CLT) structures to resist a bomb explosion. The results have led the U.S. Department of Defense to expand the use of wood for blast-resistant construction. Right here in Oregon, the design team for Framework, a 12-story CLT building soon to break ground in Portland’s Pearl District, has devised and tested an innovative structural system for the building. It will not only have state-of-the-art seismic safety, but also require minimal repairs following an earthquake. Post-tensioned cables will allow the structure to rock back and forth during an earthquake and then re-center itself when the shaking is done. That means that, unlike the vast majority of buildings – which are designed only to allow for occupants to safely evacuate during an earthquake – Framework will not need to be demolished and rebuilt once the initial danger has passed. 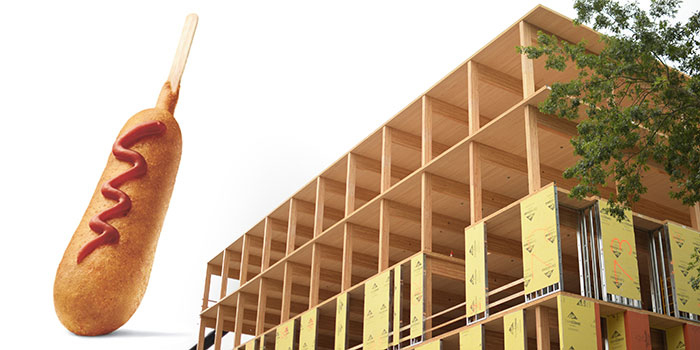 So … your corn dog likely has a wooden stick, and it certainly deserves its day, but chances are it’s not nearly as safe for you as these new wood buildings. Spring is a time for rebirth and rejuvenation, so it is fitting that KnowYourForest.org, an educational website for Oregon forest landowners, has a new look and some new content. KnowYourForest.org was created in 2012 by the Partnership for Forestry Education, a group of Oregon-based organizations that have come together to help educate the state’s forest landowners. 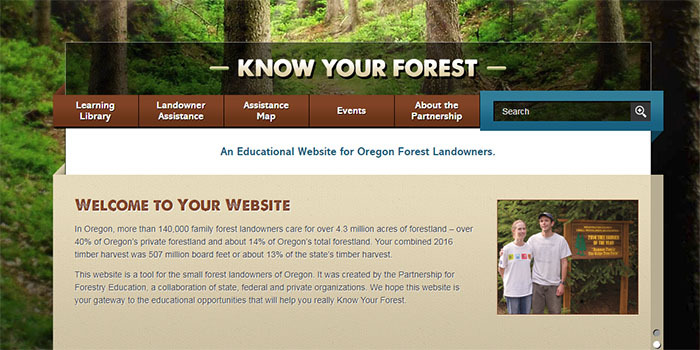 Managed by OFRI, the site provides information from a variety of public agencies and nonprofits, including the Oregon State University Extension Service, Oregon Department of Forestry, Oregon Small Woodlands Association and Oregon Tree Farm System. This is the first significant update of KnowYourForest.org since it was unveiled. It now includes new and updated content and some new features. Among the new content is a page in the “Learning Library” on forestry business and taxes, curated by Tammy Cushing, forest business and tax extension specialist with OSU Extension. This page includes a new video in which I interview Tammy about forest business issues. Updated content includes a redesign of the “Forest Management Planning” page in the Learning Library, curated by Lauren Grand of OSU Extension and ODF’s Thomas Whittington. This page features an updated version of the Oregon management planning template and a link to the new “Oregon Forest Management Planning” website that is also curated by Lauren and Thomas. The site also now features a series of new videos. In addition to Tammy’s forest business and tax video, we have two new videos on OSU Silviculture Extension Specialist Steve Fitzgerald’s wildfire page in the Learning Library. The “Making Your Forestland Fire-Safe” video features Alicia Jones of OSU Extension and Kyle Reed of the Douglas Forest Protection Association. The second video, “How to make your Home and Property Fire-Safe,” features Tom Fields of ODF and Kris Babbs of Keep Oregon Green. We also have a series of new videos on the “Forest Protection Laws” page that were developed by ODF and feature Ryan Gordon from the agency’s Private Forests Program. These shorter videos cover the Oregon Forest Practices Act’s new Salmon, Steelhead and Bull Trout (SSBT) stream buffer requirements in short, easy-to-use segments. Finally, the opening page of KnowYourForest.org features the new third edition of Oregon's Forest Protection Laws: An Illustrated Manual and the latest update to Family Forests, a resource guide for Oregon family forest landowners. These new publications can be downloaded from the site and hard copies are available to order. So, before you head out to work on your spring tree farm chores, check out the updated KnowYourForest.org website.